Crop circles are an interesting and controversial phenomenon that can best be described as a pattern in a field where the crop (usually wheat) has been flattened. Many believe that the circles are made using a string and a piece of wood to flatten the crops. This is the case here. If the radius of the center circle is 7.5 meters and the radius of the outer circles is 6.5 meters, what is the area of the flattened crops (do not include the area flattened by the outer connecting ring)? Express your answer as a decimal rounded to the nearest tenth. The geometry of a basketball court is a great study in area and circles. 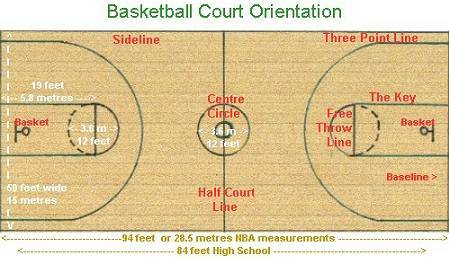 There are three 12-foot circles: one at center court and the circles at each of the free throw lines. The inner circle at center court has a 4-foot diameter. Here is a diagram. How much paint would be needed to paint all of the areas shown in green if one gallon covers 130 ft2. A local Pizza company sell pizza by the slice and has a nifty little box that fits the piece of pizza almost exactly. What is the area of the bottom of the box if the box holds one piece of a 7-inch pizza that has been cut into 6 pieces? If a sign is 2 meters wide, what percent of it is black? A ferris wheel is basically shaped like a wheel. Since most of these amusement rides are fairly large, the outer circle is not made from one piece of steel but rather several little arcs. The number of arcs is determines by the number of cars on the wheel. How long would the arc be between cars if there were 12 cars on a 30-meter tall ferris wheel?